Thinking you need mouse repellents because you just saw a mouse scurrying across? What do you do? It was just one little mouse though, right? Well, kind of. For now, anyways. If he found a way in, there is a way in for his whole family to shack up with you; they sure do have boundary issues. They chew through cardboard boxes and eat your favorite cereal, snack food, and anything that can’t withstand their tiny, rodent teeth. Your new roommate scatters drywall, insulation, and the rest of whatever else he chewed up inside your walls. This is his way of traveling through your walls and as he runs across, it’s perfectly sane to hear, “You can hear me, but you can’t catch me!” Well, that’s what he thinks, but you’ll find plenty of information here to prove he was dead wrong. He likes to keep you up at night while he searches for food and new treasure to decorate his new home with. They really know how to feng shui your shredded up rent receipts, hair you have been shedding over time, and any other trash they may find. Don’t fret because there’s good news for these unwelcomed roommates of yours. There are many different ways to rid your house of unwanted mice and discourage more from moving in. Keep in mind that just because you saw a mouse in your house, it does not make you a dirty person. Too many people seem to think that is always the case; although keeping your home clean will discourage mice from staying. The truth is any home is at risk for these pesky creatures to take up residence in. Many times, a mouse will venture into your home in search of food. If you have a clean house, he won’t be able to find food as easily, and he will move on. Food isn’t the only reason they may shack up, but it contributes a lot to it. They will also look for a warm home to shelter them from the cold winter. Even if you keep your home spotless, you always have that one mouse buffet open all the time. What buffet? I’m talking about your trash can; one man’s trash is another mouse’s treasure (and dinner!!). Just this alone can be enough reason to keep them there and invite more to come in. Mice are prey animals, as we have seen in almost every single cartoon with a mouse. The predator runs around and chases the mouse until the mouse slips away, and the predator usually smacks into the wall that the mouse just disappeared into because they were so focused on the mouse. While it provided many laughs for us as children, those cartoons have some truth to it. In my personal opinion, the best way to ward off rodent intruders naturally is to get a cat; or if you’re up to it, multiple cats. 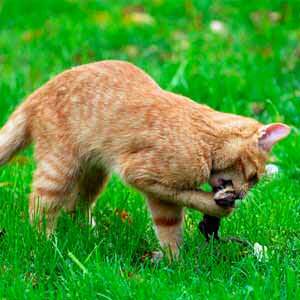 Mice will be a little more hesitant to enter your home if there is a natural predator living inside. Their number one priority is survival (thus the need to eat), so if entering is likely to reduce their survival chance near zero, they’ll probably go somewhere else safer. If you opt for a cat, it’s important to remember that cats are a lot more than just natural mouse hunters. They’ll require extra work because you need to care for them. Rodents are also a problem outside, and if they’re outside, soon they will be seeking shelter. Meaning if you see them in your yard, you should work to run them off as quickly as possible before they find your nice, cozy house. As mentioned before, mice are prey. Being outside, there are many predators seeking to make them their next meal. With that said, did you know that the smell of a snake deters mice? Mice are delicious treats for snakes. You could try keeping snakes, if reptiles are your fancy. They work inside or outside! Or you could just use other things to create their scent. Sounds nasty, but dried snake feces can repel them. Now, definitely would keep this outside. Other, welcomed, residents of the house may not want dried feces in the house. You will also need to be keep it away from children and pets. Don’t like snakes? You can promote the nesting of predatory birds in your yard. Barn owls would be the best since they love mice. Although depending on the size of your yard, you may want to seek the next best predatory bird. For someone who isn’t particularly fond of birds, or who is a light sleeper, a barn owl might not make a very good neighbor for you. If pets aren’t your thing, you’re not out of luck just yet. Pets aren’t for everyone, so it’s a good thing there are natural mouse repellents as well. Peppermint oil and clove oil are said to be natural deterrents. Whole cloves and peppermint leaves have been claimed to work as well. The cotton balls will need to be replaced every 5-7 days, as it is just a cotton ball with some oil in it. Of course, that is just a rough estimate of how often the cotton balls will need to be changed. How often will depend on how much you saturate the cotton ball. It’s best to just keep an eye on it to see when it starts to dry out. Like with any other pest deterrent, there are some cons though. If you have children or pets, you need to make sure to put these out of reach, so they don’t become a treat for tiny mouths. Be sure to read any label instructions for warnings you may need to be aware of. Alternatively, you could try planting peppermint plants near entry points to your house. If you have one plant that’s large enough, you would only need one plant. Just take a clipping and plant it in other locations. Mint plants are known for taking over wherever their planted. It spreads like wildfire, but gives a pleasant aroma around the areas where it is planted. You can check a gardening guide for tips and tricks on centralizing the growth and keeping it tame. The good thing about mint is you don’t even really need a green thumb to make it grow; it grows pretty well naturally. Don’t get too comfortable though. Even if you have natural repellents growing around the house, put in the effort to seal any possible entry points into your house. Common places include where pipes or wires enter your house. You will also want set up traps to get those feeling a little braver than usual. Another option that’s a whole lot more convenient is Fresh Cab. Fresh Cab is a very well known, very well customer rated, organic, all natural rodent repellent product. This product not only works to keep mice at away, but also works to chase out any currently sticking around. With a 100% money back guarantee, a 90% repurchase rate, endorsements from the National Home and Garden Club, registered with the EPA, and I could keep going on, I believe that this product speaks for itself. Fresh cab is a natural mixture of corn cob chips, herbal extracts, and plants known to repel mice. The mixture is held in a 100% biodegradable pouch so that it is convenient to set out around the house. It doesn’t smell bad either. The scent can be described as a smell that reminds you of a minty fir tree; unlike some of the chemicals commonly used with to keep mice away. You can find Fresh Cab mouse repellent in your local department store, but I’ll be honest here; they aren’t exactly cheap. With that being said, you know that everything is cheaper online. You can save some money if you buy them from online like Amazon. Each pouch will cover about 125 feet of an area that isn’t already occupied by mice. For areas that already have a mouse problem, you will want to increase it by one pouch for every 8 feet. If you have a big area to cover, this could be very costly for you, but if your area is small and you would like to try a natural way, Fresh Cab may be the solution for you. Besides, you don’t have much to lose with the 100% money back guarantee. If you aren’t satisfied, you get your money back. For a really thorough review of this repellent, I recommend you check out this review. An electronic ultrasonic mice repeller require seemingly little effort since you just plug them in and go. They work by sending ultrasonic sound waves through the air at a frequency undetectable by the human ear. The sound waves are said to cause confusion, convulsions and death, which is known as an audiogenic seizure response. They are safe to use around pets because they are electronic, rather than poison. They consume very little energy, so long term investment is almost nonexistent making it a one-time investment. They are also said to work for other pests as well such as insects, so they are also multipurpose. They aren’t without any downsides though. The biggest problem is the ultrasonic sounds it makes to repel mice doesn’t do very well traveling through solid objects (like your walls). That makes covering an entire floor, or large area of the house with just one device impossible. You would need at least one per room. Then there’s the problem with a room that is too big for the device. You would have to know where the mouse may travel through (unless you use multiple devices to cover the entire room). The range isn’t the greatest, so you’ll definitely need multiple devices if you have a large room. The bottom line is, mice are annoying and pesky little creatures and can be somewhat hard to deal with (not anymore since you’re here). Whether you choose to adopt a new furry/scaly friend, choose a natural mouse repellent, try traps and snares, or try your luck with the electronic devices route, you can at least now choose your mice repellant strategy with knowledge of the different options. Personally, I would elect to go with Fresh Cab because it has the best ratings, fewest cons, and each purchase comes with a money back guarantee, so it really couldn’t hurt to try! Otherwise, if you’re open to traps and other ways to get rid of mice, they work even better. I wish you luck in your mouse-ridding journey!